It's over. The insane amount of travel is over and I can finally spend sometime in my favorite vacation spot- my couch... in Las Vegas. I'm not really spending a lot of time on the couch outside of evenings, as during the day I'm working hard to try and get my golf game back in shape to where it was. I have a big bet that looked really good for me back in August, but since then my schedule got so crazy I never had time to play. In the last week of August I shot 83, 84, and 83 in my last three rounds and was on the verge of shooting an 80 which wins me the bet. I'm running out of time, and the only way I'll have a chance is to spend every bit of free time I have either playing, or practicing. I've played 11 rounds this year and it took me 10 rounds to break 100. Today I played 36 holes and shot 98 then 96. Those numbers look really bad, but when you consider the previous week I was shooting like 108, it's a step in the right direction. A lot has to go right to shoot an 80, and right now I'm not even worried about that. The first key is just getting comfortable out there again. My short game was rusty, but that's an area I'm completely unconcerned with. It's the strongest part of my game and it's already coming a long way. This course is long for me, so I rarely ever hit any greens at the moment. Even when I was shooting low 80's I was only hitting about 4-6 greens a round and my shot game would save me. My last three rounds I've hit zero greens. I'm not hitting the ball anywhere near as far as I was when I was playing regularly. Distance will come, but first I have to get my mechanics down. I need to make sure I'm not taking the club back to the inside, and also that I'm swinging from the inside. I both practice and play. As I'm playing rounds, we are always working on some aspect of my swing. Sometimes that causes tempo issues as I'm getting used to it, and other times it can cause me to be a bit erratic, but I'm just creating muscle memory both on the range and out on the course so that it becomes ingrained. I'm not gambling with anyone right now so I can actually work on swing changes as well. Previously I could never do that because when you are gambling you just have to "go with what you got" and do the best you can with the swing you have. You can't change things out on the course. My swing has always been extremely flat. That helps me consistently hit the ball straight, but it also restricts me in terms of distance which I desperately need. I'm working on drills now to change that swing and I really like the look and feel of it. I watch the difference on video and it's just night and day. With my old swing, when I take the club back my hands are parallel with my chest. With the drills, my hands at the top of the swing are closer to my head. The tough part for me at the moment is combining that with a swing path that comes from the inside. Anyone who golfs understands that it's imperative to come from the inside on the downswing. I used to do that fine, but not the right way. I would take the club back inside and lose all my coil/power. Chipping and putting isn't an issue. I'm already getting close to where I need to be there and in a week or so it will be solid. The distance issue, though, turns some of these par 4's into par 5's for me, where I'm hitting driver, 3 wood, and then maybe a 9 iron into the green. In the past on those long holes I'd be hitting driver, 3-wood, and then just a pitch from maybe 25-30 yards. I'm not going to be hitting greens from 440 yards out. Not by May 28th anyway. I just need to be around the greens in regulation, and at the moment that's not the case at all. Once I get back to where I'm shooting in the mid 80's, I won't be wasting time. I'll start on #1, but if I don't make par I'll just start over. If after about 7 or 8 holes it doesn't look good for 80- I'll scrap the round and start over. Time is of the essence, and I can't waste any daylight if I'm close to having a shot at an 80. I can't wait to play poker tomorrow! I'm so freaking excited about this show. I put in a decent amount of work on my 6 handed game online and I feel really good about it. That, plus I had a bit of an epiphany poker wise while in Monte Carlo. All signs to me doing well, but we shall see. One thing I love about our show, is that FINALLY there is a rule in place where you can't hide like a chicken behind sunglasses! I swear every TV producer should ban sunglasses entirely from any televised event. They are so bad for poker on so many levels. Poker wouldn't be on TV if everyone wore hoodies and sunglasses to hide their eyes. I'm so happy when I see online guys like Tom Dwan, Patrik Antonius, and Phil Galfond man up by not hiding behind shades. The majority of the best players in the world DO NOT wear sunglasses. 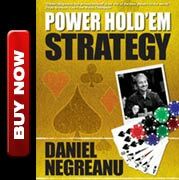 One of the biggest differences between live and online poker is the ability to see your opponent. Eyes and all. Doyle Brunson doesn't wear shades. Phil Ivey doesn't wear shades. If anyone wants to start a petition to ban them in any form of poker whether it's tournaments, cash games, or televised events I'd do whatever I could to help. If you wanna wear shades when you play online, go for it! 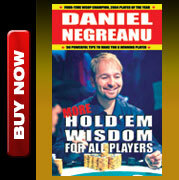 If you wanna play on The PokerStars.Net The Big Game then you'll just have to man up and take those silly things off! There are other key reasons why sunglasses should absolutely be banned at a poker table, but I won't get into that. Let's just say that guys like Russ Hamilton would appose such a ban. I heard Durr say it on High Stakes Poker last week and he is absolutely right. You should always be uncomfortable playing high stakes poker against someone wearing sunglasses. I'm not making this up, it's just a fact. Banning sunglasses helps to protect the integrity of the game against cheating. For that reason alone, they should be completely outlawed from poker. No other sport or organization would allow competitors a device that makes it easier for them to get away with cheating. I won't be tweeting any results from the show. I'll be playing on the 5th, 8th, and 9th of May. On the 6th I'll be doing 36 holes, then on the 7th I'll be on a really fun golf reality show that I actually watch and enjoy. The 10th is another golf day, commercial shoot on the 11th, then it's the $25k heads up SCOOP event and the $10k main event. I may golf WHILE playing the SCOOP. I have a wireless card, I can make it work!